Think of Jamestown, New York and what comes to mind? We’ll start with the WKSN/WHUG pair, since that was the first one we saw that day in Jamestown. 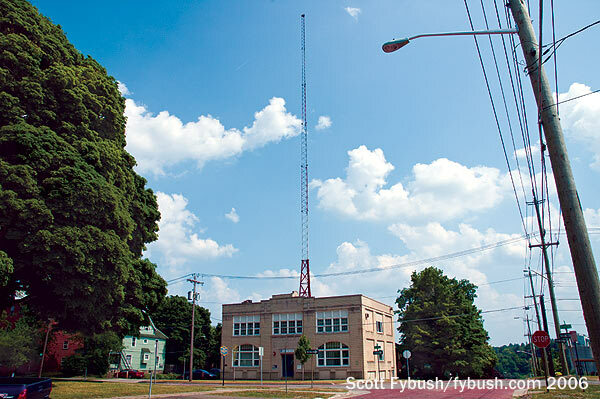 WKSN is actually one of the most interesting AM sites in upstate New York, with one of the few rooftop towers remaining. In fact, it was the only one in the state then, though it’s since been joined by the nighttime tower of WSIV (1540) in Syracuse. WHUG was north of town, on a hill that rises above what was then Route 17, the Southern Tier Expressway, and is now I-86. You can see the little tower with the two bays on Horton Road in the picture to the left. 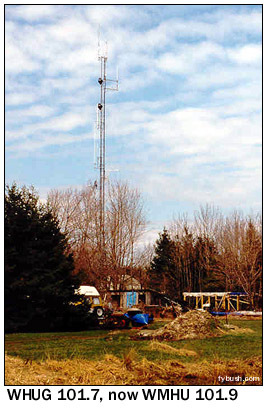 Nearby, but not shown here, is another tower that carries WUBJ, along with additional towers for a variety of two-way uses and LPTVs. WJTN, which was doing news and talk then (and still is now), had its tower on Jones and Gifford Road, west of downtown in the swampland at the south end of Chautauqua Lake. But this little flagpole-style tower is hardly the highlight of this pair of stations. To see that, you have to head southwest from Jamestown into the town of Busti and up the hill to Orchard Street. 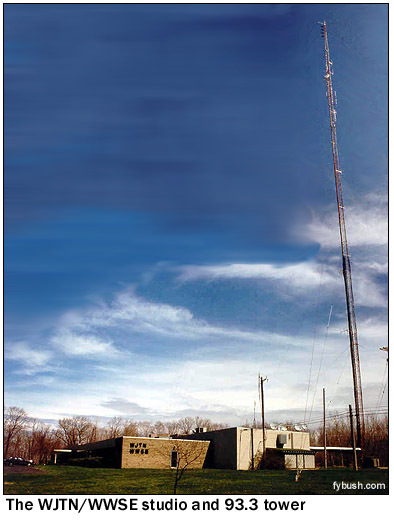 In any case, the Orchard Street site, shown in the photomontage above, was and is home to the WJTN/WWSE studios and the tall tower of WWSE, the big class B FM that reaches almost to Buffalo with its AC format, then known as “SE93.” This tower was also used for a time by channel 26, which had a second brief run in the late eighties as a local independent station, WTJA, before once again going dark. 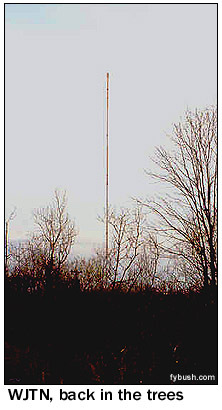 It was later reactivated under the WNYB-TV calls as the flagship for Tri-State Christian TV’s Western New York network, from a new tall tower up near Dunkirk that puts a very respectable signal into Buffalo. We’ll show you one more site from the vicinity: about twenty miles or so to the east along I-86 sits the community of Salamanca, served by WGGO (1590) doing oldies and WQRT (98.3) doing rock. 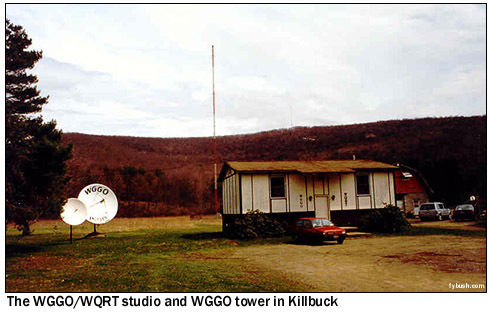 Here’s the studio and AM transmitter site on Killbuck Road in the hamlet of Kill Buck, just east of Salamanca. Now, to the changes: Vox bought WKSN/WHUG a few years after our visit, and made some big changes. 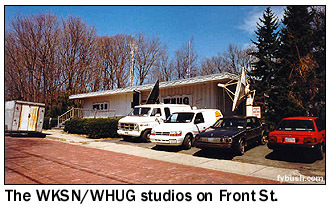 WHUG sent its call letters south to Pennsylvania and became WMHU, “Moo 102,” to match WMOU-FM (102.1, ex-WOWQ) in DuBois, PA. Even before that, the Vox folks did some frequency-hopping, moving WHUG from 101.7 to 101.9, where it now plans to boost power from class A to class B1, helped by an allocations swap that will get another 101.9A, east of town in Alfred, out of the way. Vox also bought that Russell, PA station on 103.1, which is now known as WQFX, “the Fox,” still playing rock. As for the James group, it flipped WWSE to a hotter adult-contemporary sound as “Mix 93.3” a couple of years ago, keeping the calls intact. And there’s a brand-new signal in Jamestown that we need to visit one of these days, too! In the fall of 2000, WKZA (106.9 Lakewood) signed on from studios in the Hotel Jamestown and a transmitter just south of town over the Pennsylvania border, playing hot AC as “Kiss.” Perhaps this summer we’ll revisit this market and hear all the changes. 2013 update: We’re still way overdue for a return trip to Jamestown, so close by and yet so far. A few updates from this piece, now more than a decade old: the two competing commercial groups back in 2002 are now one – Media One combined the former Vox and James groups into one big cluster, all based in a renovated studio facility up at the Orchard Road site that was WJTN/WWSE when we last visited. In addition to news-talk WJTN and AC WWSE, the cluster now includes WKSN (doing oldies) and the station formerly, and now again, known as WHUG, doing country at 101.9, plus rocker WQFX (103.1) licensed just over the state line in Russell, Pennsylvania. Across town, WKZA recently added a sister station, FM drop-in WLKW-FM (95.3 Celeron), doing news-talk. In Salamanca, WGGO is now doing sports and WQRT has become WQRS, still with a rock format under new owner Pembrook Pines Media. 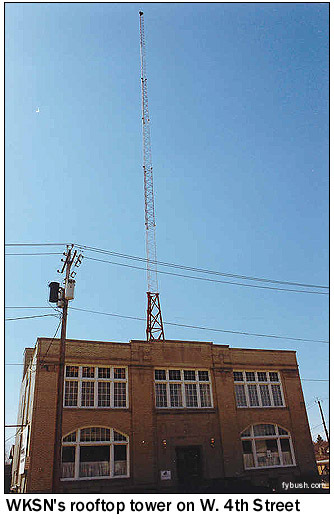 On the transmitter front, the WKSN rooftop tower is no more; once WKSN and WJTN became sister stations, Media One diplexed both AM facilities at the old WJTN site on Jones and Gifford Road. But the WKSN rooftop lives on in one of the photos in Tower Site Calendar 2014…which is why we’re presenting this installment to you as a bonus this week! Yes, the 2014 Tower Site Calendar has technically been two years in the making, since Scott gathered photos for it on the cross-country drive. But the wait is over. 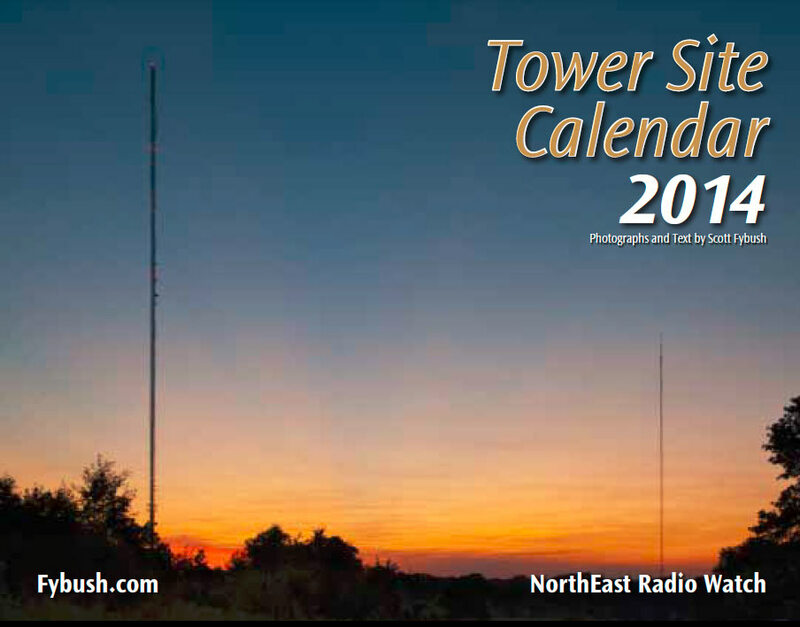 The Tower Site Calendar, 2014 edition, has gone to press, and you can be the first to reserve your very own. We expect delivery at the end of the month, and we’ll send them right off to their loving homes, spiral bound, shrink wrapped and best of all, with a convenient hole for hanging! This year’s gorgeous electronic pinups include the iconic towers of Catalina Island, a combiner system in St. Louis, the twin towers of KNRS in Salt Lake City, that historic rooftop site in Jamestown, New York and many more! If you want a tower calendar on your wall NOW, you can pick up the current edition for just $5 with your 2014 order!